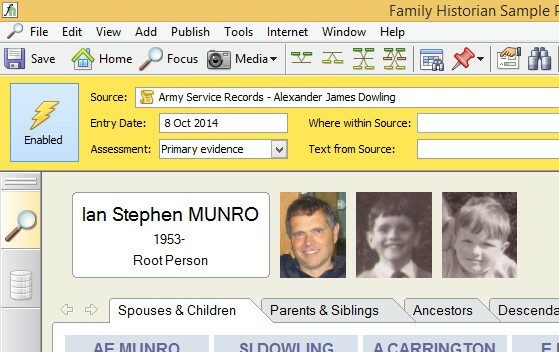 Family Historian is a genealogy software package written by a leading UK software designer for the UK market. 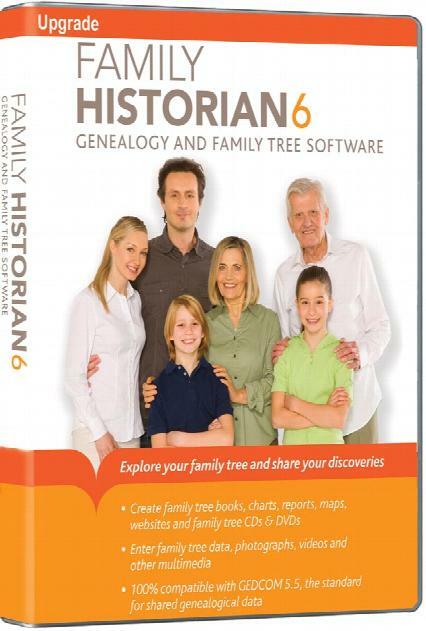 This award-winning genealogy package has a huge number of features. 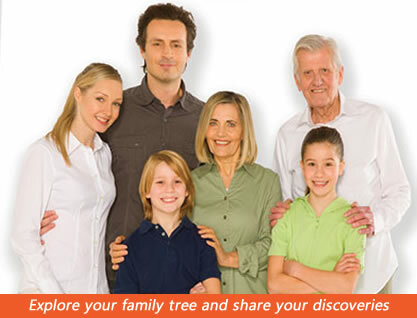 It allows you to enter your family by drawing a tree, as well as by entering the data one person at a time. Full support is given for sources, notes, facts and linked multimedia elements. For professional researchers it provides support for Queries and Reports, allowing you quickly find what you need. This boxed copy is the full program. It contains all the features above, and much more! The box includes an installation CD and a printed quick-start guide to get you up and running. Also includes a free Find Your Ancestors Book & Online Subscription to TheGenealogist worth over £30 (exclusive to S&N Genealogy Supplies). 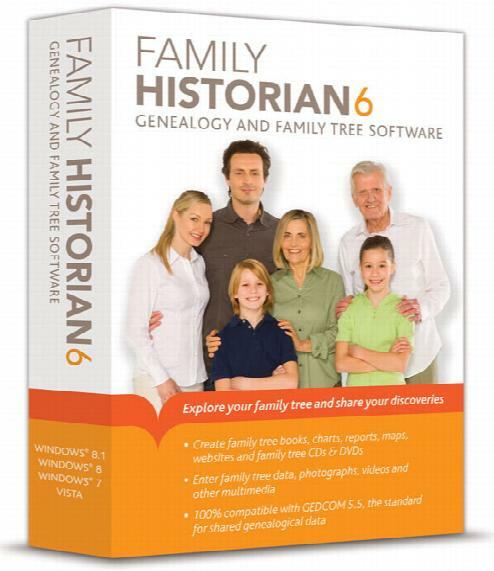 This will upgrade your Family Historian Version 5 to the full Version 6 program. Please be aware that this upgrade to version 6 will only work for users who have version 5 (either the full or upgrade versions). If you do not have a full or upgraded copy of version 5, you would need to purchase a full copy of the program (left)(above). 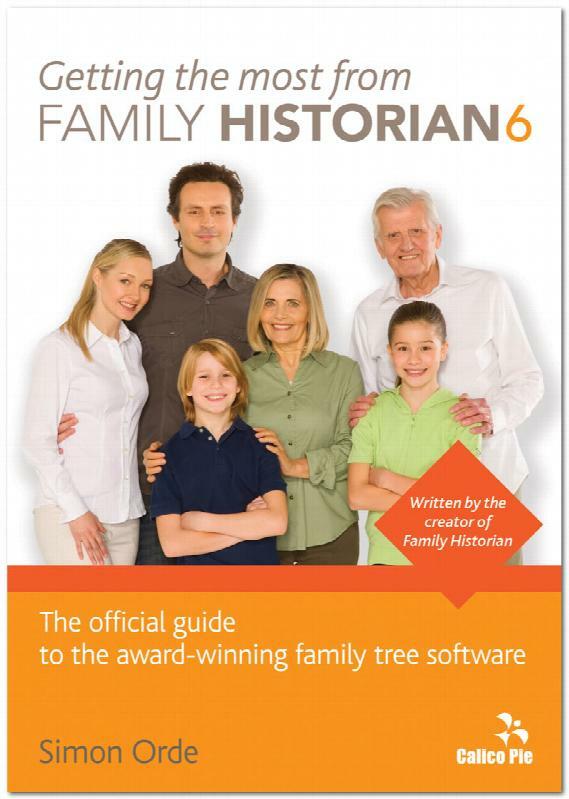 Written by the creator of Family Historian, this book covers all the basic features of the program, as well as the advanced and expert features. It is designed so that you can treat it either as a book to read, or as a reference manual, to dip in and out of. It is suitable for beginners and advanced users alike.(left)(above). Interactive diagrams are used for browsing, exploring, and editing - as well as printing. 'Smart Trees' make creating charts easy. Comes with 31 highly configurable reports and you can create your own custom reports using standard reports as templates. 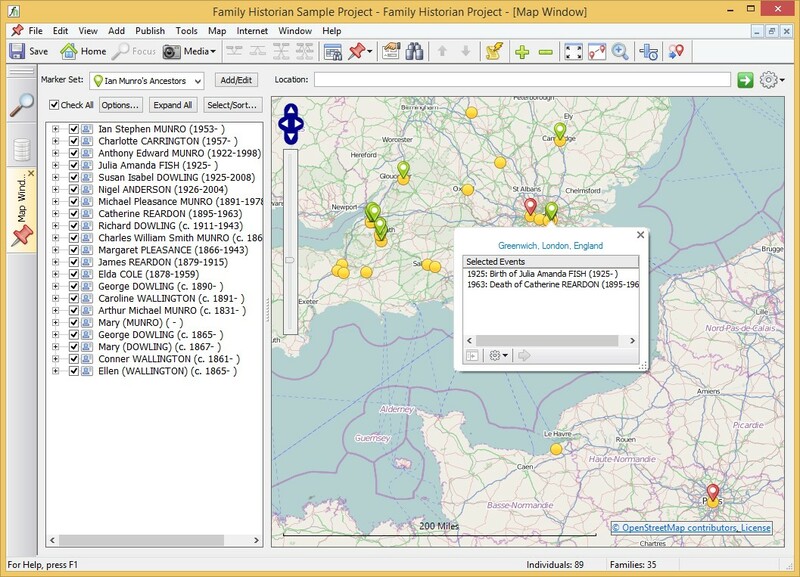 Family Historian 6 will have a new workspace window called the Map Window. You can use it to map the locations of all the places and events in your projects. You can even view family movements over time, using the Time Slider. 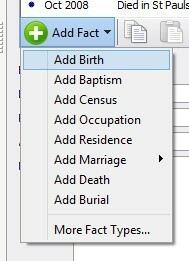 You can choose any combination of people and events, and filter on event types - and use the same or different markers. Click on a marker to view all the events that occurred there in a popup window. This means that you can show all your ancestors' birth places marked in red, and all your spouse's ancestors' birth places marked in green, for example. Moving around the map, and zooming in or out to see more or less detail, is easy and fun. And you have a choice of two different map styles. The new web search window is a complete web browser in a window and allows easy browsing of the Internet and is one of the components of the new Web Clipping Capability (see below). The new window integrates with the Internet Search tool which can now maintain Web Search Window bookmarks. Although there are several advantages to using the Web Search window (such as support for drag-and-drop), you can always use an external browser if you prefer - either for Internet searches or for Internet Data Matching. The Media Window has been completely redesigned and given a much-improved look. 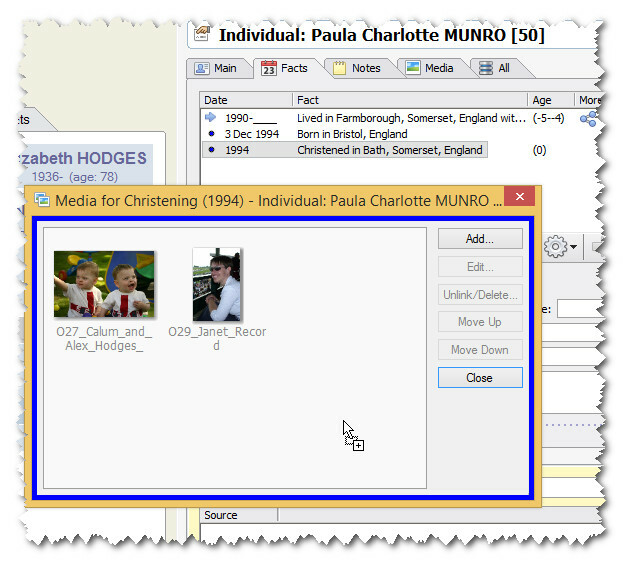 A new Media Link Tool now makes it very quick and easy to add 'frame links' (links to faces). Click-and-drag from the tool onto an image, or click on one of the buttons at the bottom of the tool. The Media List Pane (on the left side) now has enhanced filtering options. Click to view all frame links for any given picture, making it easy to see who is missing. Click links to 'play' a media file, or to locate it on the hard disk. If a link is broken, these links will show underlined in red and Family Historian can now search for 'lost' images, if required. The old Automatic Source Citation dialog has been replaced with the new Automatic Source Citation pane which is docked at the top of the screen whenever an Automatic Source Citation is enabled. The apparently simple pane is deceptively powerful and makes it easy to find and create source records and source citations. The Automatic Source Citation pane is another component in the new Web Clipping Capability. 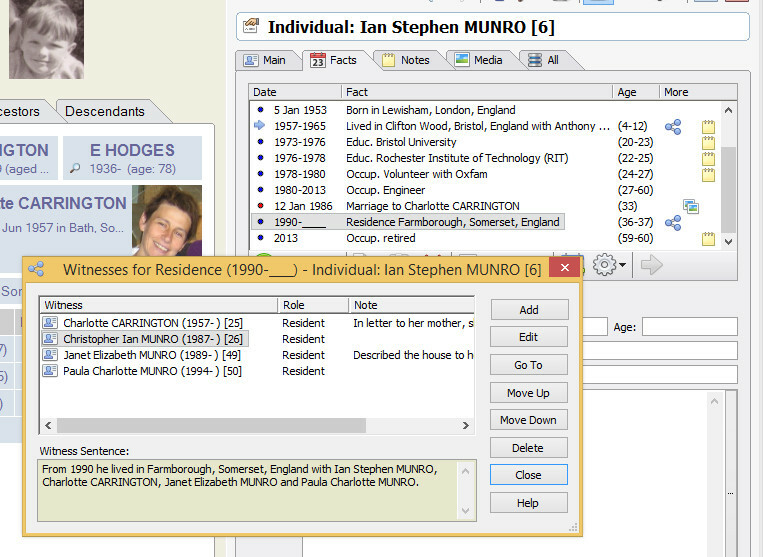 Extended family 'timeline' facts can now be viewed in the Facts tab of the Property Box for each Individual. 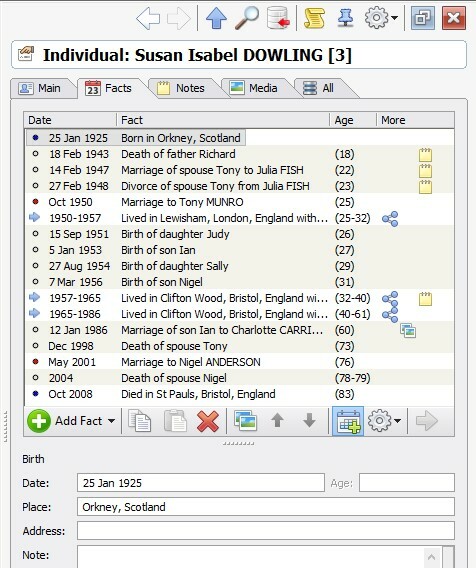 Timeline facts include events such as birth, marriage, divorce and death, for parents, siblings, spouses, children and grandchildren - all fully configurable. Timeline facts can be easily 'toggled' off or on, and are distinguished from normal record facts by a light grey background. They give a quick overview of all the key events in a person's life at a glance. 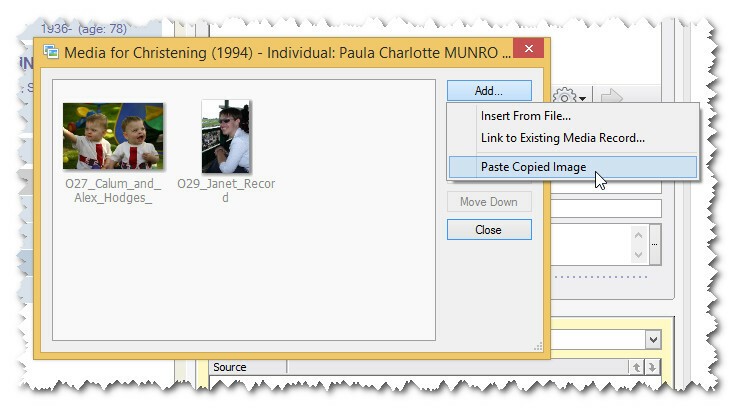 A new 'Individual Timeline' query can be used to show the same timeline facts in the Query Window, or be printed as a report. Adding facts is now significantly quicker and easier thanks to a new 'Fast Add' menu which appears when you clicking on the 'Add Fact' button on the Facts tab. The 'Fast Add' menu is configurable. Any fact type can be added to it, or removed from it. There are similar menus on the Note and Media tabs. 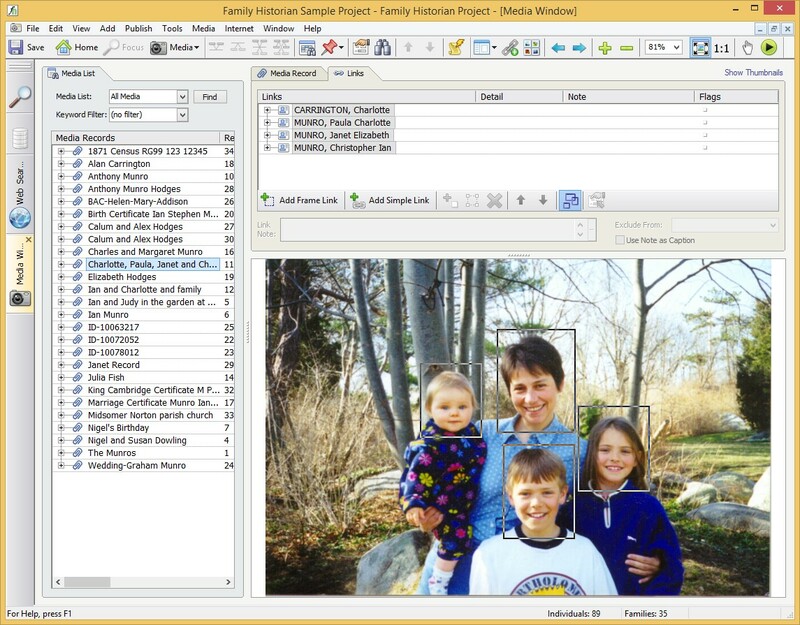 The ability to link pictures and other multimedia to places, is the top feature in the Family Historian Wish List, voted for by users. Now you can attach as many pictures as you like to each Place, and include them in reports. With each place, you can also record notes, a standardised name, and a latitude and longitude. You can drag-and-drop text from the Web Search Window, or from most word-processors, onto any name, date, place or other text field, in the Property Box or Automatic Source Citation pane. You can drag-and-drop images (typically, from a web browser, or from file explorer) onto the Media tab of the Property Box, to add pictures for the person or other record type. 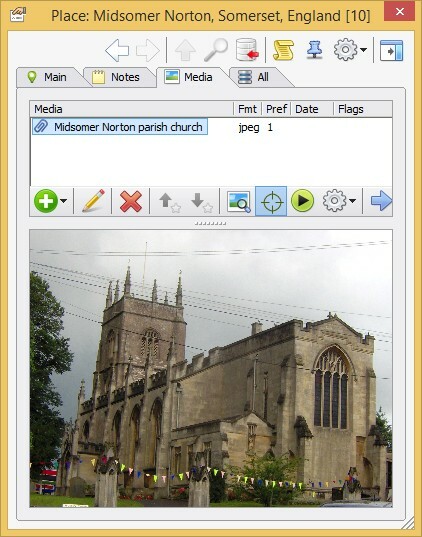 You can drag-and-drop images onto the Fact Media Window to add pictures of an event (such as the christening in the example shown above). Websites (or web browsers) that may not allow you to drag-and-drop images, may nevertheless allow you to copy them. You can now add copies of images directly to your project (and link) in all the same contexts that you can drag-and-drop. Family Historian now uses 'Unicode' internally, which means that it can store any character from any language and any accent. Entering accent characters is now easy. If you press-and-hold any letter, when typing in any field in the Property Box or in the Automatic Source Citation pane, a popup window will appear just above the field, with a choice of accents for the letter in question. The choice of accent characters listed is configurable, and can include accent characters from one or more combinations of well-known languages, and your own custom additions. The Accent Character popup window can be temporarily disabled, if you want a character to auto-repeat, by pressing-and-holding the Insert key while pressing a letter key (or fully disabled in Preferences, if you wish). The overall look of the application has been much improved, with new toolbar images and icons everywhere. A number of improvements have been made to provide better support for screens (some of which are sometimes called 'retina' displays) which have a high density of pixels. This includes providing 3 sizes of toolbars: small, medium and large (selectable in Preferences). The old Find dialog has been replaced with a new and much-improved Find tool, which lists all matching results in the Find tool itself. Whereas the old Find dialog just found records (in the Records Window), the new Find tool lists all matches - to the field level. So a search term may find multiple results within the same record. Each found item can be shown in the Property Box; or the entire result set can be moved to the Results tab of the Query Window. A new Find and Replace tool allows text replacements throughout a project - either in specified text fields, or all text fields, with confirmations for each one if required. Replacements, with before and after values, can be viewed afterwards in the Results tab of the Query window, and the entire search-and-replace can be undone, if required, by clicking Undo on the Edit menu. Finding one or more records in a list of records is now much quicker and easier thanks to new filtering boxes at the top of the window. For example, to view all Individuals with a given surname, just type the surname into the Surname filter field at the top of the window. Filtering options are available for all record types, wherever record are listed (such as in Selector dialogs for reports). The filtering options available depend on the record type. The 'How-Related' tool now provides new options for displaying diagrams showing how selected individuals are related. You can opt to hide spouses, siblings or both. You can now have multiple Query Windows, and you can lock them and set re-use options for them in Preferences. There are 3 new standard queries: 'Events Near Place', 'Places' and 'Individual Timeline'. 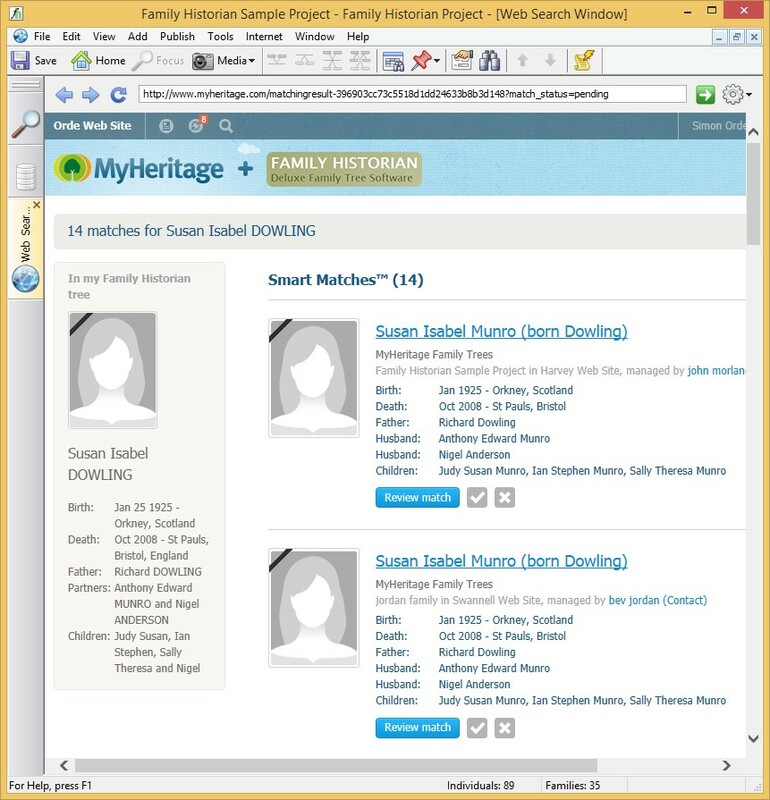 The layout of both of the Ancestors and Descendants tabs has been improved. You can now optionally display age information in the first two tabs of the Focus Window. Children which are the file root or ancestors of the file root, now have a little blue arrow pointing down, making it easier to find your way back to the root. And there have been sundry other enhancements in details. A new option allows alternative names to be displayed in narrative reports. Another new option allows prefixes and suffixes to be display for Individuals in narrative reports. There are new options for sentence templates (see Enhancements for Power Users below). Sentences about witnesses can now also be included in Narrative reports (see Support for Witnesses above). You can now choose from different colour schemes in Preferences (General tab), including 'high contrast' colour schemes for people with vision problems. You can also create your own colour schemes using the new 'Export Colour Scheme' and 'Import Colour Scheme' menu commands on the Import/Export submenu of the File menu. The colouring options have been increased and improved throughout the program. Modeless windows have numerous usability advantages. For example, you can open the Witnesses window, and view all witnesses for each fact in the Fact tab of the Property Box, by simply stepping through the list without needing to open or close any windows. You can also use the Source Citation pane to add or view source citations for names and titles in the 'Names & Titles' window. And you can drag-and-drop images from the Web Search window onto the 'Show Media' window. All of this is made possible because these windows are modeless. CD/DVD burning drive/software required to create family CDs/DVDs, Internet connection required for Internet Search features, and web space is required if you wish to upload created websites to the Internet.